Today’s electronic systems are in a continuing, evolving design cycle where more smaller, and hotter components are being crammed into tight enclosures. These expensive systems need to remain dependable and reliable. A fan failure may result in other delicate and expensive components failing, causing costly repairs and delays. The best way to deal with fan failures is to know exactly when a fan fails and moderate the system until repairs can be made. Comair Rotron currently offers two ways to monitor the fans performance. A Tachometer Output is an easy and inexpensive way to monitor the speed at which the fan is running. The customer will need to develop circuitry to read the tachometer signal and determine when the fan has failed to provide adequate cooling. A Fan Performance Sensor (FPS) has the circuitry internally in the fan to read the tachometer signal and determine if the fan has failed. Both options are further described below. Figure 1. The square wave has a 50% duty cycle with an amplitude of Vout. On most fan models, the tachometer will have 2 pulses per revolution. A few others will have 1 pulse per revolution. The standard amplitude, shown as Vout is 5V. This voltage level is set internal to the fan. See Figure 2. The customer will need to develop electronic circuitry to monitor the output and detect a failure. The customer may desire a Vout of a different amplitude. Comair Rotron can provide that output up to the value of the input voltage (i.e., a 24 VDC fan would generate up to 24V square wave on the sensor lead). If the customer wishes to set the output amplitude, Comair Rotron can provide an open collector output. There is no output on the sensor lead until an external pull-up resistance is attached. The value of the resistance will need to be determine so that the current is limited to 15mA. See Figure 3. On most models, the fan is offered with either an isolated or non-isolated sensor circuit. A fan with an isolated sensor would have five lead wires. Two solid colored power leads [Red (+), Black (-)] provide power to the motor windings. There would also be three sensor circuit leads [Red/White (+), Black/White (-), and Blue/White (sensor output)] to power the tachometer and the signal return. See Figure 4. A fan with a non-isolated sensor would have only three lead wires. Two solid colored motor power leads [Red (+), Black (-), and Blue/White (sensor lead)}. 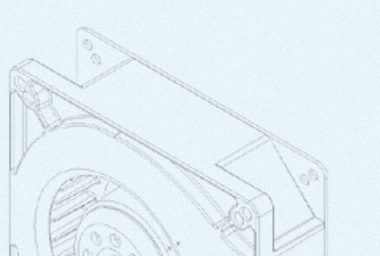 The power for the sensor circuitry is internally derived from the power of the motor windings. An isolated tachometer is typically used where a negative voltage potential is used to power the fan and a positive voltage potential is used for the tachometer monitoring circuitry. The two different voltage potentials have different references to ground return and therefore have to be isolated. A non-isolated tachometer output is typical and can be found on almost every fan model. The Fan Performance Sensor (FPS), for DC fans, is the second type of sensor signal offered by Comair Rotron. It offers a constant output through the sensor lead. The output is derived from a Hall Cell in the same manner as the Tachometer Output. However, there is additional circuitry internal to the fan to condition the output and provide a constant Vout. The output can then be hooked directly to an alarm, LED, buzzer, relay, etc,. The output will remain constant until a specified RPM level is reached. At that point, the signal output will change to a different state. The RPM is typically set at a threshold of 1900 RPMs. The FPS version offers several different configurations; which must be selected in order to match the downstream electronics of the customer's equipment. These options are further discussed below. The output of the sensor has 4 different configurations available. These configurations will determine the Vout and the logic level of the output. Open Collector: The signal is derived from the collector of the output transistor and requires a pull-up resistor. The resistor must be set so that the current is limited to 15mA. The output logic is high on pass, low on fail. Downstream electronics can be tied between the supply voltage (Vcc) and output only. See Figure 5. Inverted Open Collector: The signal is derived from the collector of the output transistor and requires a pull-up resistor. The resistor must be set so that the current is limited to 15mA. The output logic is low on pass, high on fail. Downstream electronics can be tied between the supply voltage (Vcc) and output only. See Figure 5. TTL Compatible: The signal is derived from the collector of the output transistor and is internal pulled up to 5 volts. The output logic is high on pass, low on fail. Downstream electronics can be tied between the supply voltage (Vcc) and output only. See Figure 6. Inverted TTL Compatible: The signal is derived from the collector of the output transistor and is internal pulled up to 5 volts. The output logic is low on pass, high on fail. Downstream electronics can be tied between the supply voltage (Vcc) and output only. See Figure 6. The delay feature eliminates nuisance trips of a failure signal during startup of the fan. The delay is set at 10 ±4 seconds from the moment the fan reaches the RPM threshold. A “no-delay” will trigger an immediate alarm after the fan has reached the RPM threshold. If the RPM recovers and exceeds the threshold, both options will go to an immediate pass condition without any delay. The signal can also be "Latched" to remain fixed in the failure mode, or "Non-Latched" to return to the pass mode when the fan has exceeded the threshold RPM level. A latched output will hold the signal in the failed state even if the fan returns to full speed. The latch must be reset by interrupting the power to the FPS and the output load. The "Non-Latch" option will produce an output that returns to a pass signal as soon as the RPM returns to the acceptable level. On most models, the fan is offered with either an isolated or non-isolated sensor circuit. A fan with an isolated sensor would have five lead wires. Two solid colored power leads [Red (+), Black (-)] provide power to the motor windings. There would also be three sensor circuit leads [Red/White (+), Black/White (-), and Blue/White (sensor output)] to power the FPS and the signal return. A fan with a non-isolated sensor would have only three lead wires. Two solid colored motor power leads [Red (+), Black (-), and Blue/White (sensor lead)}. The power for the sensor circuitry is internally derived from the power of the motor windings. See Figure 7. An isolated FPS is typically used where a negative voltage potential is used to power the fan and a positive voltage potential is used for the FPS monitoring circuitry. The two different voltage potentials have different references to ground return and therefore have to be isolated. Both non-isolated and isolated FPS options can be found on almost every fan model. AC Fan Performance Sensors operate slightly different than their DC counterparts. The AC output is derived from an electrically isolated pick-up coil which generates an AC signal with an amplitude proportional to the speed of the fan and the voltage applied to the fan. This signal is then internally conditioned to generate the discrete pass/fail output similar to the DC FPS. This option is only available on larger AC products such as the Patriot, Falcon, Major, and Maltese fans. The output of the sensor has 2 different configurations available. These configurations will determine the Vout and the logic level of the output. 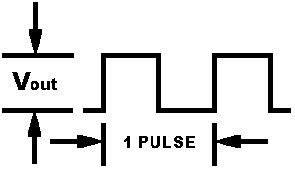 Open Collector: The signal is derived from the collector of the output transistor and requires a pull-up resistor. The resistor must be set so that the current is limited to 15mA. The output logic is high on pass, low on fail. Downstream electronics can be tied between the supply voltage (Vcc) and output only. TTL Compatible: The signal is derived from the collector of the output transistor and is internal pulled up to 5 volts. The output logic is high on pass, low on fail. Downstream electronics can be tied between the supply voltage (Vcc) and output only. There are many different ways to monitor the condition of a fan. The main focus of this paper is to demonstrate the possibilities that exist in Comair Rotron fans. The need for close monitoring of cooling performance has been a continuing need for thermal engineers for many years. As equipment gets more exotic and costly, it can be easily seen that value added features such a simple tachometer are a daily necessity. Comair Rotron has created many different outputs for easier integration into our customers systems. Each method has its own merits and purposes. If you have additional questions regarding choosing the right method for your application, please contact our Application Engineering Department where our knowledgeable engineers can assist you.